Only 26 hours to go, and we'll have our tickets! Anyone who has ever known me in the slightest has gathered what a Star Wars freak I am. It probably started with the out of control Harrison Ford crush I had growing up (even today, I will buy some stupid magazine like Ladies' Home Journal if Harrison Ford is on the cover) and with the advent of cable/VCRs, I was able to watch the Star Wars movies practically everyday. My parents came to dread the sound of the 20th Century Fox Studios intro music, knowing that they were in store for an evening of me rehearsing dialog from any given movie. 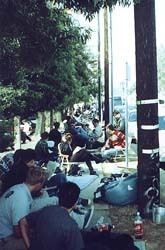 Ditching 8th grade and getting up at 5am to wait in line for "Jedi" still ranks as one of the greatest times I've ever had. I had heard rumors about the upcoming prequels ever since "Jedi," and even was assured that the next movie would be called "The Clone Wars." But I never thought that by the time the next movie came out, I would have been waiting half my life. First of all, pretty cute how tickets went on sale a week earlier than the movie, thus forcing everyone to stay in a huge, ridiculous line TWICE. 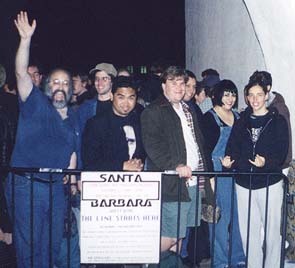 In Santa Barbara, 700+ people spent the night to buy tickets! So we all woke up (if we slept) around 5 am and put our sleeping bags and stuff away. I studied for, and then took a final, which I actually did okay on. More of our friends started to arrive and since Adam was first, we had to negotiate with the people behind us as far as adding people to our group. It was more because there were rumors of action figures being given out to the first "x" amount of people through the door, but that ended up not happening. Then I was talking to some other people further down in the line and since the topic kept coming up asked how many people they had in their group, and they took out this humungous clipboard and said, "something like 54." So then I didn't feel bad. Tension mounted as the theatre manager started to break up the line into four shorter lines, positioning one in front of each theatre door. No one approved of this, because obviously we had been there a really long time and it wasn't fair to let a bunch of other people in at the same time as us. Plus it seemed like she was assuring a stampede. But it turned out she was having the lines go in one at a time, and we were first, so she lived. They let people in two hours early, I guess because it'd take a long time to let everyone in, and then also they could sell tons of concessions. People got a little antsy and then rowdy as the "bat the beach ball around" thing turned into "take hold of the beach ball and hit someone else on the head with it as hard as possible." At one point some girl got hit squarely in the face from just a few feet away and the whole theatre booed. I've also never seen so much toilet paper fly through the air. That got to be kind of mesmerizing, or maybe I was just starting to lose it. When the lights went down and everyone started cheering, it was deafening. I had an uncontrollable grin on my face. The audience decimated the previews with boos-- you couldn't even hear what the "In a world" voiceover guy was saying. Only Austin Powers was given a break, and people cheered a lot for it. I really enjoyed this movie, and think it's so-so reviews are a little unfair. I wonder if it had been a movie totally unrelated to Star Wars, would it have been criticized so thoroughly? Isn't kind of ridiculous to say, "Well it's no Star Wars, because of this, this and this... therefore it was a weak movie." Or maybe I'm just taking it a little personal. Okay I'll just give you one example. Our local entertainment weekly gave a severly harsh review of TPM, saying the acting was "Keanu," and basically it was a fluffy piece of trash. The reviewer thought that the villians were introduced in a very anti-climactic way. First of all, have you ever heard of subtlety? Does every Star Wars villian have to be introduced with obvious scary music, a smoke machine, and a dramatic pan up his imposing, black-armor clad body? Second, eventhough the reviewer was a supposed big Star Wars fan, he didn't even mention in his critique of the villians the real bad guy to watch out for-- Senator Palpatine. I know some people actually didn't get that connection with the Emperor, but if you're going to the trouble of reviewing the movie and pointing out that you're a fan, I'd like a little insight. Plus the same guy interviewed us in line, and obviously didn't care much for the assignment, based on his disinterested questions and total misquoting of us.